The Summer of contests continues with this one being offered from Rhythm Magazine and Sabian Cymbals. Enter this exclusive competition and you, along with a friend, will be in with a chance to meet Neil’s right-hand man, drum tech Lorne Wheaton who will take you onstage for a guided tour of Neil’s phenomenal drum set-up (click here for a sneak preview). The kit tour will take place at London’s O2 Arena on Wednesday 25th May, and the prize also includes two pairs of tickets to watch the band perform that evening. 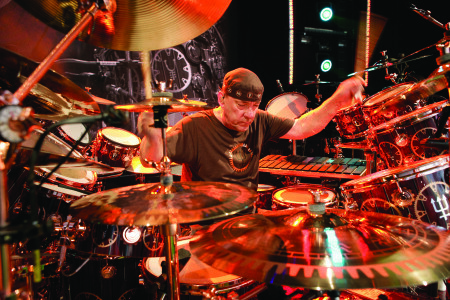 To be in with a chance of winning we want to know how much of a Peart fan you really are. In no more than 25 words, explain why you are the world’s biggest Neil Peart superfan and deserve this all-access pass to check out Neil’s kit. The more creative you are the better! Closing date for entries is 9am on Friday 20th May.